Roadblock is a heavy machine gunner for the GIJOE Team and their own gourmet chief. 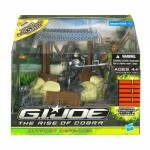 He takes on Cobra forces with an array of heavy weaponry and has the brawn and tenacity to use it with relentless precision. From desert to ocean, jungle to arctic tundra, battling evil requires a mobile fighting force. Wherever the G.I. JOE team makes its base, the Outpost Defender is there! It’s equipped with a heavy machine gun and enough firepower to repel advancing enemies, making time for the rest of the G.I. JOE team to mobilize. The battle only gets better when you add this Ourpost Defender battle set to the mix! 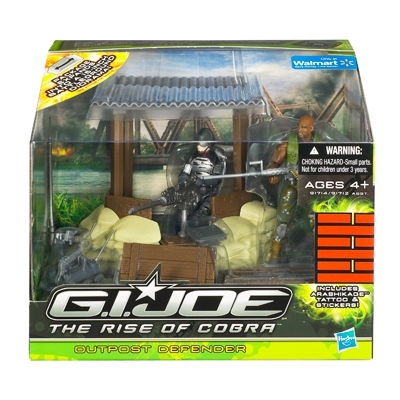 Show the bad guys you can hold them off, no matter where they attack, by setting your TRIPWIRE and ROADBLOCK action figures behind the sandbags and “wooden” walls to start “blasting”. 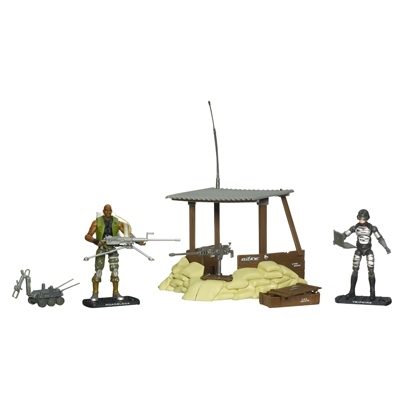 With a machine gun accessory for your ROADBLOCK figure, rifle accessories and a munitions box that opens, you’ve got enough “firepower” to not only hold off the bad guys, but also to make a major dent in their forces! Put on your ARASHIKAGE tattoo and use the stickers to remind you that the real war has only just begun! 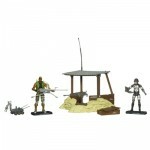 Battle set comes with TRIPWIRE and ROABLOCK figures and ARASHIKAGE tattoo and stickers.